You have been improving your patient’s oral health for years by keeping their dentures clean with Renew denture cleaner. Now take the next step and replace your patient’s current multivitamin with one designed specifically for denture wearers. • Dosage can be adjusted as new denture wearers become used to their dentures and as OnePro supports their dental and general health through the lifetime of their denture. 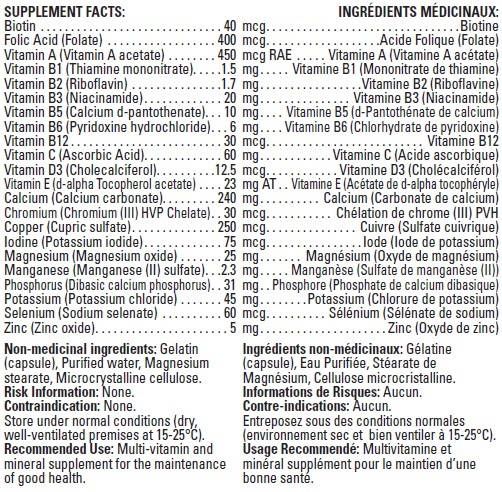 Click here to see the full list of OnePro ingredients. How OnePro helps your Clinic – Contact Us to Order OnePro today! M Rathee, A Hooda. Nutritional Status In Denture Wearers: A Review. The Internet Journal of Nutrition and Wellness. 2009 Volume 10 Number 2. • OnePro is manufactured in Canada under cGMP conditions meaning you can be assured of high quality manufacturing processes and ingredients. The Health Canada registration number is NPN 80046091. Download the OnePro brochure.